Cyril died in 869 and Methodius in 885. They were soon canonised as saints, with Saints Cyril and Methodius Day being celebrated on 24 May to mark the anniversary of Cyril’s death. Slovakia agreed to remove the halo despite Cyril and Methodius’ undisputed status as saints. 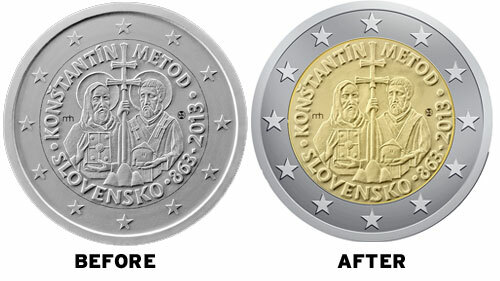 “Under EU rules, when designing the national side of a euro coin, Member States are required to take into account that the coins will circulate throughout the whole eurozone, and in that context, proposed designs are shared in advance with other Member States so that they can provide any comments they deem appropriate,” the Commission said in a statement. UPDATE: At the 37th meeting of the Bank Board of Národná banka Slovenska on November 23, 2012, it was decided, following an outcry, to return to the original draft design (including halos).